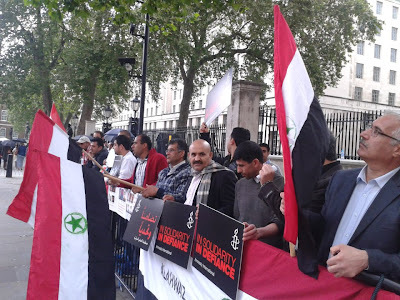 Members of London's Ahwazi Arab community gathered outside Downing Street yesterday to protest against the recent executions of Arab political prisoners, but were met with hostility from supporters of the self-proclaimed 'opposition' Green movement. Ahwazis voiced their support for the British government's call for UN Special Rapporteur on Iran Ahmed Shaheed to enter Iran and assess the human rights situation facing minority groups. A recent video statement by Ahwazi prisoners before they were hanged emphasised the importance of getting Ahmed Shaheed into the country. The demonstration was opposed by supporters of the Green movement who were holding a simultaneous demonstration in support of Mir Hossein Musavi and Mehdi Karoubi, who are under house arrest. They complained to the police over the use of the Ahwazi flag, but no action was taken. However, Kurdish protesters who attended in support of the Green movement joined with the Ahwazis in solidarity. Nasser Bani Assad, spokesperson for the British Ahwazi Friendship Society, said: "The Green movement, a faction of the Iranian regime, has failed to garner much interest among Ahwazi Arabs in Iran. The Green movement has not once condemned the executions of innocent Ahwazi Arabs who have. "Not one month goes by without an Ahwazi Arab being murdered yet not one member of this fake opposition has raised a voice against the regime's anti-Arab execution campaign. 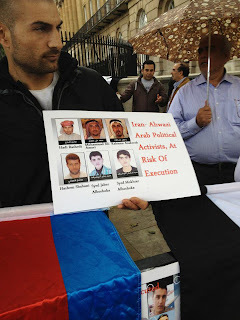 Instead, their supporters abroad want to silence the Ahwazi voice on the streets of London. "The Green movement is irrelevant because it refuses to address the marginalisation and persecution faced by ethnic and religious minorities. Its leaders are yesterday's men. Musavi himself is a cruel torturer and murderer. He is no democrat. He should stand on trial with the dictator Khamenei and others for crimes against humanity."